When I photographed this gay wedding at Robinson Ranch Golf Club, this couple was an absolute joy to work with throughout the day. For the bride on the left, this was her father's golf course and they had a house situated near one of the greens. The clubhouse had these wonderful large bay windows looking out on the course in the mountains in the background, and I really wanted to take advantage of those in this photograph although I could have used lighting, expose for the outdoors, and then lit the subjects so that you could see both the subjects and the outdoor areas, I chose instead to only expose for the couple and let the background outside the windows become overexposed. To me, that decision enhances the mystery of this image as I'd like to think that viewers see the lesbian subjects looking off into the distance together into an unknown but likely wonderful future together. 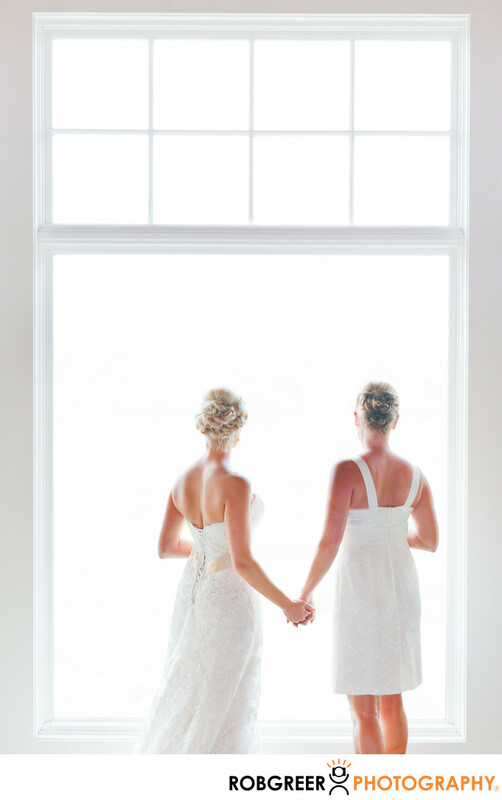 I particularly love how the light wraps around the two brides and in particular how the light falls across the back of the bride on the left. From a wedding details perspective I also enjoy the fact that every object in this image is white, and yet you can make out every detail on the dress of both brides. Robinson Ranch Golf Club is located in Canyon Country, California. Phone: (661) 252-8484. Website: http://www.robinsonranchgolf.com/. Contact Person: Jayne Gates, (661) 252-8484 x22, jgates@robinsonranchgolf.com. Location: 27734 Sand Canyon Rd, Canyon Country, CA 91387. 1/60; f/8.0; ISO 1000; 58.0 mm.